I asked Sophie Blackall (Finding Winnie), Bryan Collier (Trombone Shorty), Kevin Henkes (Waiting), Ekua Holmes (Voice of Freedom: Fannie Lou Hamer, Spirit of the Civil Rights Movement), and Christian Robinson (Last Stop on Market Street) to answer two questions and finish one sentence starter. Today is Kevin Henkes's time to shine. Thank you, Kevin! Mr. Schu: ​Congratulations, Kevin! Everyone loves hearing about THE CALL. What ran through your head when the phone rang? 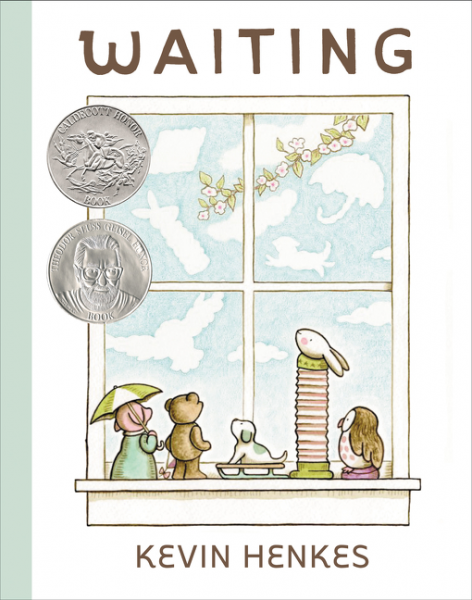 What were you thinking about when the Caldecott committee was clapping for you? Kevin Henkes: Any time the phone rings at 5:30 a. m. my first thought is that something terrible has happened. By the time the committee was clapping, my brain was catching up and was starting to realize what was actually happening. And, of course, I was thrilled. Mr. Schu: What does the Caldecott mean to you? It means a much longer life for my book. And that's a wonderful thing. Borrow Waiting from your school or public library. Whenever possible, please support independent bookshops. Love Kevin and his work! I am a HUGE fan of Kevin and his work!